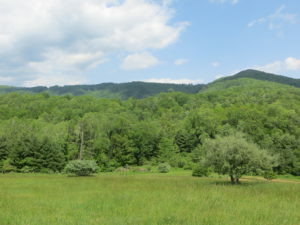 Along the beautiful South Toe River in Celo, NC winds a long and narrow strip of land host to Green Toe Ground Farm, a biodynamic operation run by Gaelan Corozine and Nicole DelCogliano and their two daughters, aged 11 and 16. It was our third stop along our 2016 CRAFT tour rounds, and it couldn’t have been a more beautiful day. Gaelan and Nicole have been farming this land since 2001, and their knowledge and experience shone through their explanations of their biodynamic farming techniques, adopted from years of practice and experimentation. 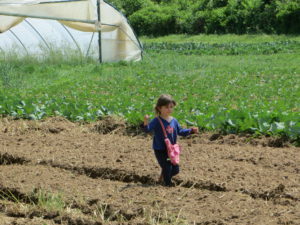 The philosophy of biodynamics, an approach to farming based on the teachings of Rudolph Steiner incorporates many elements all defined through Steiner’s eight Agriculture Courses. 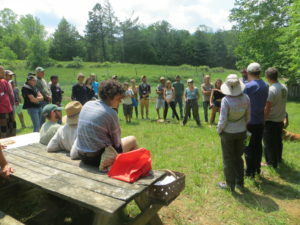 Generally, biodynamic farming techniques focus on a “whole-farm vision”, creating a holistic farming system that addresses nutrient cycling via animal, mineral and plant integration: “If mushrooms are growing, I know I’m doing something right!” Gaelan points out. The biodynamic approach to farm management includes each of the ecological, economic, and social sustainability of a farming operation. 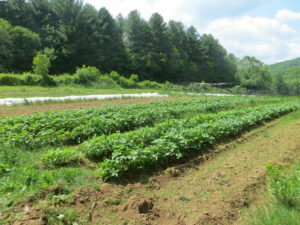 The ecological sustainability of a farm includes application of Steiner’s “biodynamic preparations” (created by using a combination of manure, plants, and animal parts) which incorporate homeopathic doses of nutrients into biodynamic farmland. Biodynamic farming techniques also address the cosmos’ effect on plant growth and nutrient cycling. The Biodynamic Calendar indicates “root”, “fruit”, “leaf” and “flower” periods, corresponding with “earth”, “fire”, “water”, and “air” elements. Each of these periods encourages farming activities specific to the periods’ emphasized plant characteristic. According to the calendar, there are times in the moon’s cycle that are good for planting and others for harvesting. Gaelan discussing preps by the river. 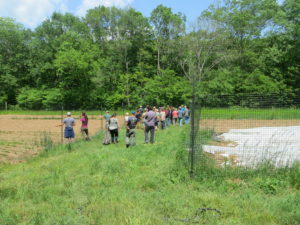 There are many ways to approach biodynamic farming, but the main one that Gaelan and Nicole touched on during the tour was their approach to utilizing the compost preparations, 5 preparations which are inoculated into a compost pile. This inoculation creates biodynamic compost which they then apply to all of their cultivated beds. In addition, in the fall Gaelan and Nicole make “Preparation 500”. Preparation 500 is made by filling a cow horn with manure (from their cows Gerda and Valentina), which is buried in the soil to transform from November to February. In spring, usually mid May, the horn is dug up, the potentized compost removed, diluted in a water solution, and then sprayed over the fields. 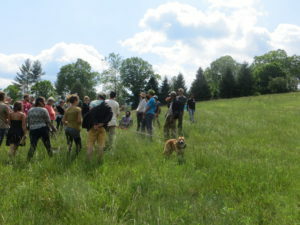 Both of these processes, in addition to other preparations, such as Biodynamic compound and Preparation 501 and 508, help to create dialogue on the farm. “The nutrients and the plants are having a conversation, and the preps help create an intelligent soil that can talk back,” explains Gaelan. The farmer serves as the mediator between all these earthly and cosmic forces. 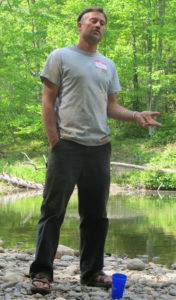 “We like to think of ourselves as observers and participators in plant growth, not dictators,” notes Gaelan. 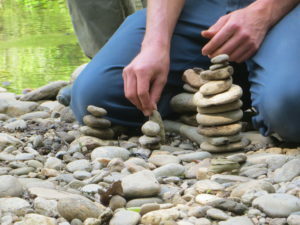 Biodynamic preparations help the farmers at Green Toe increase organic matter and biological activity in their alluvial soil, and have made an observable difference in the quality of their produce and their connection with the land. 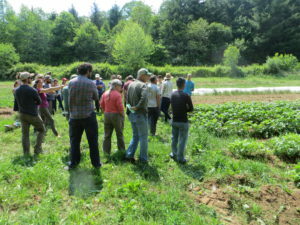 The intimacy that comes from observing their piece of land so thoroughly has allowed for experimentation that most market farmers wouldn’t dream of. For example, last summer, they didn’t water their crops in the field at all until August. Going from being a 100% CSA operation to market and retail operation has also afforded experimentation. Green Toe’s elevation, at 3,000 feet, makes competing with the early season market difficult, but by staggering their crop plantings and having different products at different times they are able to compete at the markets. After a beautiful meander through the fields and down to the river to discuss (and smell!) 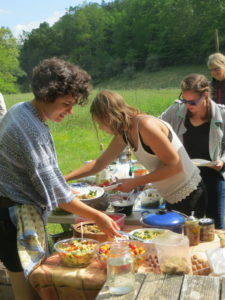 the biodynamic preps, we made our way to the potluck table. Gaelan and Nicole had the cob pizza oven going, which was a delicious addition to the colorful spread of vegetables and fruits brought by tour participants. There’s nothing like the community that comes with sharing a meal, especially with those who take such pride in bringing food they have grown themselves. Thanks so much to Gaelan and Nicole for hosting, and to tour participants for coming out and enjoying the afternoon! See you at the next tour. 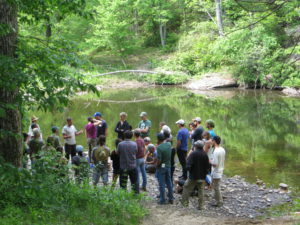 Biodynamic talk at the river. Children running through the fields!